1) For international guests it's really inconvenient to have to pay by bank transfer rather than card. It added an extra cost to the price of the stay because of bank fees. Also, the substantial deposit was only accepted in cash. It made us really nervous to hand over this much cash, and it also upped the overall costs because of the exchange fees. The owner should consider taking card to make it more convenient. 2) We were a bit surprised at the steep cleaning fee - I didn't think the ad mentioned anything. When it was requested, I looked back at the ad, and the fee is not included in the listing of mandatory costs. It is, however, included at the bottom of the 'house rules' description, the only thing on the page not translated in English. So English-speaking guests should be aware of this. Also, for a place with such a high cleaning fee, I would have expected it to be cleaner, but walking around barefoot blackened your feet and the shower head was so calcified it didn't work properly. 3) A lot of the things we would have expected to be included in a self catering apartment weren't there. There were no towels when we arrived and took some from the hall cupboard, which the owner later chastised us for. There was also no toilet paper, so our first hour in Avignon was spent running around trying to find an open Carrefour on a Sunday. 4) We came to Avignon from the wedding of a friend. 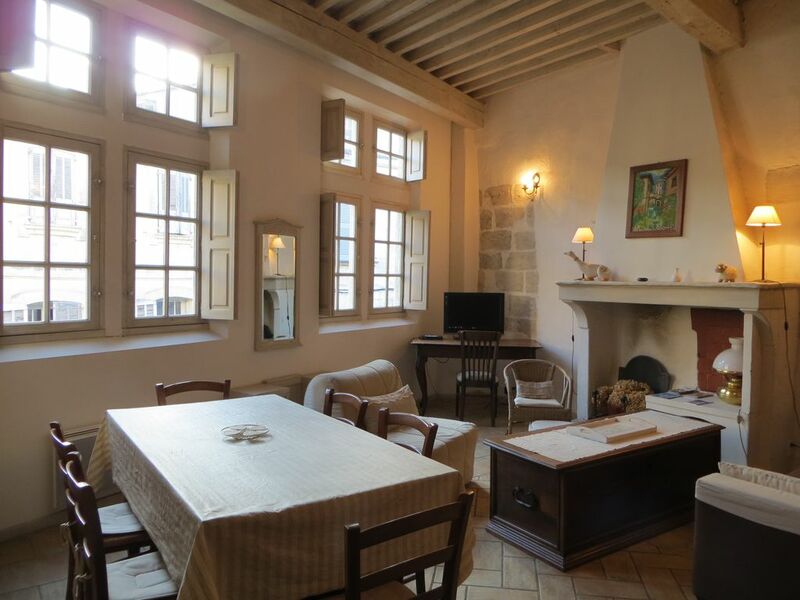 When we were there, we found that a few friends needed a place to stay in Avignon for a night. Since the apartment said it could accommodate the number and, when we checked the website quote, it was the same regardless of number of guests, we invited them along. We didn't hide this fact, and when we arrived, the owner's lovely parents showed us the pull-out couch. The night before we had to leave, the owner texted my husband, telling him that, because we had friends, she would be taking a large amount out of our deposit. This was frustrating. We were fine paying a nominal additional charge, but the amount requested to stay one night on a pull-out sofa was really steep, and the owner had no interest in negotiating. Since she had our money, there was little we could do. So, between transfer fees, an unexpected cleaning fee, and an arbitrarily large amount off our deposit, the stay cost us at a lot more than we were expecting. Avignon is amazing, and we'd love to return, but we won't be staying here. 1 : The guests knew our rules (bank transfer, deposit, cleaning fees) before renting and they accepted them ! 2 : I let the towels and the toilet paper in the bathroom myself but for 4 people not for 7 and I suppose that's why the guests took the liberty of taking them in my private cupboard without asking. 3 : The price of the renting that I gave them was for 4 people as they asked. They never told me that they finally would be 7. When I understood that, I called HomeAway which advised me to take additional fees. I decided to ask 50€ for the 3 additional people (that is to say : 16,66€ per person for 2 nights). I never said that I would be taking a large amount of the deposit (I have still the texts we exchanged). 4 : The text, description and pages have been translated by the site and not by myself ! As a conclusion, I have to say that in 10 years of renting apartments, I've never seen such dishonest remarks and lies. Evidently, I will be extremely satisfied not to host these people again. My family of 5 stayed here in August 2012 (2 Adults, twin 13 year old boys and one 11 year old girl). It was beautiful, charming and in extremely good condition having just been renovated. The apartment is much better than what is seen in the pictures. It was very clean, elegantly decorated with comfortable furniture and accessories. The apartment had everything we needed to cook dinner. The location is great because it's not loud with tourists but is close to the center. The Owner was a delight, easy to communicate with and very accommodating. There was no air conditioning but there was a fan in each bedroom. It was still a little hot at night...but it was August. This would not stop us from staying here again. Tip: if you rent a car; park it on the outside of the wall in the public lot for free (next to the Ferris wheel) and walk to the apartment. It was easy access and close through the wall. We highly recommend this apartment! J'ai passé un mois très agréable dans l'appartement Le Pinson. Il y a en fait trois appartements disponibles dans ce bâtiment xvème siècle qui a beaucoup de charme et est complètement rénové. La situation dans Avignon est idéale, dans un quartier du centre ville agréable et animé, sans doute plus tranquille que d'autres quartiers du centre ville le soir. L'appartement en lui même est très confortable, fonctionnel, moderne et très bien équipé (appréciable pour un long séjour). J'ai passé un très bon séjour à Avignon, merci beaucoup ! The apartment is very liveable and well situated. There is nice separation between the sleeping and living areas. We stayed for one month and had most everything we needed. Valerie was very responsive and spoke English very well. The location is central to retail shopping and cafes. We found a fantastic green grocer and boucherie within 5 minutes walk, in Place St. Didier. Also, there is a great cafe, Subito, that serves a tasty Plat du Jour for under 10 euros, directly next to the apartment. It would be a 5-star apartment if some modest amenities were included, like dishwashing soap and cleaning supplies. But those are available in the Petit Casino around the corner (not open Sundays). Overall, we thoroughly enjoyed our stay at Gigi et Marinette. The apartment is beautiful. Nous avons loué un appartement absolument charmant pour nos amis qui ont été ravis de leur séjour.Propriétaire très sympathique.Très bien situé.Au calme.Décoration et confort parfait !